Sunday Oliseh has said he would rather lose a job than go to jail for taking part in “illegal activities” as coach of Dutch club Fortuna Sittard. 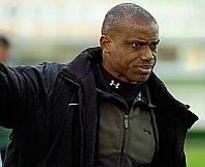 Fortuna Sitard announced Oliseh was suspended allegedly over his poor relationship with both players and officials. But Oliseh said he would rather walk away along with his assistants than be jailed for going against the law. The former Nigeria coach, who only recently led the club to a record seven straight wins, would not wish to disclose the crux of the matter, but rather hinted on owed salaries and wrangling within the club. The former Juventus and Ajax Amsterdam midfield star also maintained that even in the event that his suspension is overturned, he would rather move on. “It has been 14 great months coaching this club, we set records like winning seven straight games, we are looking at the top league, but should my suspension be rescinded, I won’t go back to the club,” he said. The post Oliseh: I don’t want to be in jail appeared first on Vanguard News.